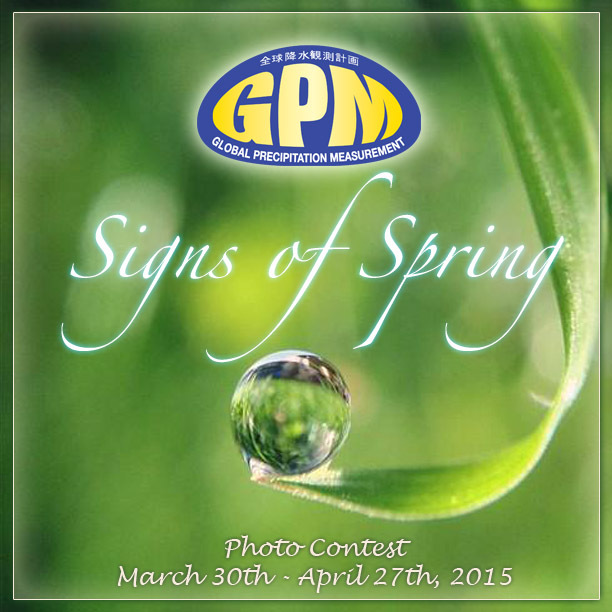 The Global Precipitation Measurement mission is happy to announce the top winners of the "Signs of Spring" photo competition. Thank you to everyone who submitted their best pictures of spring precipitation. From March 30th through April 27th, 2015, over 800 photos were submitted via Flickr and Instagram. We loved all of your entries and thoroughly appreciate your participation. We'll be sending the winning submitters GPM posters, lithographs, pins, and NASA and GPM stickers. Stay tuned and follow GPM for information about future events and contests. "This image was captured on my balcony in San Diego on February 3rd, 2015." "I love walking around the neighborhood after it rains (which is rare) to look for interesting flowers or other subjects that are likely to collect water and make for a cool macro shot. On the day I shot this, I didn’t have to go very far since this web on our balcony was glistening with water drops in the morning sun." "The photo was taken at the Judean desert to the south of israel, at a seasonal stream called Nachal Zohar. Nachal means river, but there are no rivers in the dessert. Sometimes it does rain in the winter but it depends on the year. This year we were blessed. Nachal zohar is near Neve Zohar, a village near the Dead Sea, and it's the lowest Village in the world - so this photo was taken in the lowest place in the world. The winter of 2014 and begining of 2015 was a very wet winter. We had unusual amounts of rain. The desert was filled with large and rare quantities of so many kinds of flowers, and the soil was enriched with water. This photo was taken in March 13, Friday afternoon. I went with my daughter on a family fieldtrip for the weekend in the south with friends. We do it quite often. We have a guide and we love it! In this photo we see the soil that gets lots of water, and after days of sun it dried into those forms. Like a split chocolate cake. The footprints that you see are of a passing wild desert fox that walked there when the soil was still wet. It dried and split, leaving the fox's signature." "I'm an architect that has practiced Interior Design for twenty years. I have my own firm and love my job. I'm half German and half Italian, I grew up in Holland and I live in Tel Aviv, Israel. I have many hobbies, like all kinds of sports, diving, traveling (my dream is to take flying lessons and become a pilot...) As a child I loved astronomy, and of course my main hobby now is - photography. As for photography, I joined Instagram about two and a half years ago and I love this media. Last month I had a great honor that two photos I took while on a bike trip in Burma were displayed on a photo exhibition. They where photos of children and a riverbank, you can see them on my IG account. Also I was fortunate and blessed that a hotel I designed, 250 rooms, bought my photos to display in the rooms. They were photos of Bauhaus Architecture in Tel Aviv, my beloved city." "Rain in the dessert is cool because it is welcomed, even in dangerous amounts. Many spring sights do not last long and are treasured. This photo was taken on a discovery walk with my kids after a storm. " "This photo was taken on an early season hike with my dog in the North Cascade Mountains, just east of Seattle. This year, my roommate set herself the ambitious goal of completing 52 hikes in 2015, a goal that I have also adopted. My hike to Lake Twentytwo was the 15th hike of the year and the first long trail I have done solo. This year, winter has been exceptional mild in the Pacific Northwest, with snow lingering only at the higher elevations. I was intrigued by these ferns growing through the snow and the strange in-between space where they were coming to life." "I am an avid hiker and amateur photographer - social media has allowed me to play around and create these small pieces of art from my life, which is fun. " Taken near Yates City, Illinois on June 5th, 2010 during a regional tornado outbreak. "In this image a barn is being impacted as the tornado skirts the town of Yates City, shortly thereafter the tornado impacted Elmwood, IL approximately 2 miles East of Yates City. We had been chasing the storm since the Mississippi river and were relieved to learn that no injuries of fatalities resulted from this tornado even though a tornado emergency was issued for the city of Peoria as the storm weakened. " Sagano Bamboo Forest in Arasihiyama, located in Kyoto Prefecture, Japan. "I had visited Kyoto 15 years ago and never had a chance to visit Arashiyama or the Sagano Bamboo Forest. Arashiyama is a UNESCO World Heritage site and many photographers have published photos of the bamboo forest. Since I've seen others photos, it immediately made to the top my list of places to visit while back in Kyoto. The light filtering through the bamboo and greens of the forest compelling. As it happened, I traveled back to Japan during peak cherry blossom season. But, it was raining that day, a definite sign of springtime. Rain makes flower and blossoms bloom and as it happened, the GPM satellite was launched in Tanegashima, Japan in 2014 with part of its mission to measure rainfall and precipitation. The visitors with their umbrellas in the bamboo forest became in its own way a rainforest and a reminder in how important it is that rain and forests are protected for the environment and fresh water supplies on our planet. We, as people, depend on fresh water. I posted the photo on Earth Day and the NASA reminder of #NoPlaceLikeHome." My favorite photographs to take are landscapes, places I visit whether it's business or personal travel, people and things in natural light, candids, and my daughter. Anything that tells a story. One day I'll set up a photo website but I've been having too much fun as part of the Instagram community." "I was just visiting the beach and brought my camera to take picture. I came across the geese flying in interesting patterns, back and forth, I continually took pictures until, I got that perfect shot! The picture I took was actually the top half of the shot. I then loaded the original picture onto my phone and used an app which helped me double the top layer and flip it 180 degrees, and put in a water effect." "I began photography when I was about 10 years old at a camp called Usdan Creative and Performing Arts Camp. It was a great experience and definitely helped me to prepare for high school photography courses. I have won some contests in the past for photography which I am really thankful for! I have also professionally photographed events, which were all amazing experiences. Also, I am looking forward to be president of my high schools camera club in the upcoming school year!" "I was taking a walk in the rain with my macro lens to capture signs of spring. I noticed this branch, with a rain drop clinging to it. The tip of the branch reminded me of a dragon's face." "I am a young photographer from Calgary, Alberta, Canada with a love of learning the trade. I have a particular interest in macro photography. Instagram Username: @sir_cooper_the_1st"
"Nothing much, I was walking down the pavement while a line of 'dead' beautiful flower caught my attention on the floor. So I bent down and got a close up with it!" "I'm a grade 10 student of Lord Beaverbrook High School, Calgary, Alberta, Canada If you wish to see more of my photos follow me on Flickr at https://www.flickr.com/photos/131965337@N05 "